here is some work i did before leaving for a little trip to the States. the little tiles are a project that A has been working on this summer, it was interesting to learn a little about the mathematics behind Islamic tiles. they're really fun to play with. 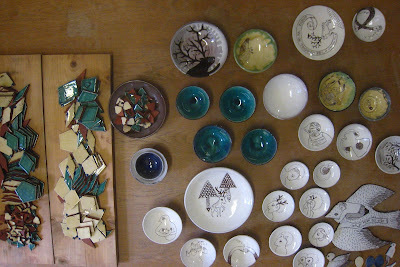 i also did a transfer firing, and added some gold to a few pieces, which was fun. so now i'll be without the studio for a month, but it's a good chance to do lots of drawing and thinking.